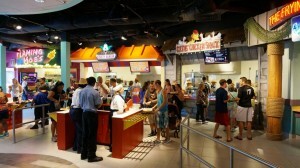 The Simpsons Fast Food Blvd offers guests the most unique quick-service items available at Universal Orlando in a themed environment that will amuse everyone in the family — and blow away Simpsons fans. 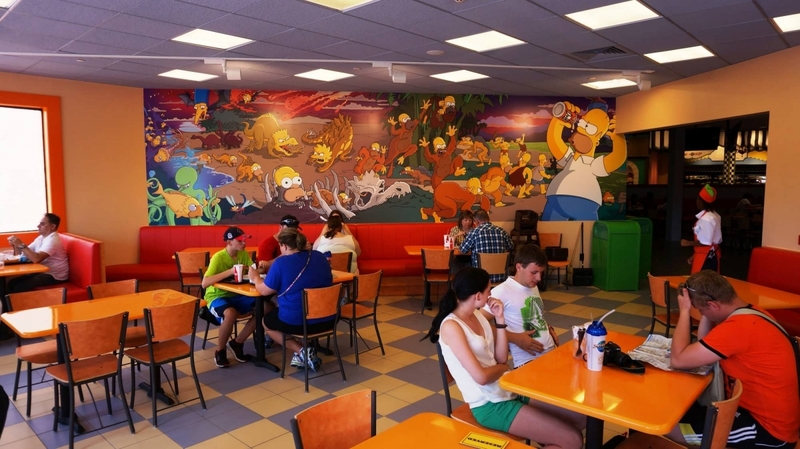 Our site has individual pages for each of the six venues that are part of The Simpsons Fast Food Blvd. But we also provide this “overview” page to give you quick access to the entire Fast Food Blvd menu. This page also provides you with a place to write a review of all of Fast Food Blvd instead of the individual venues. The Simpsons Fast Food Blvd seating. 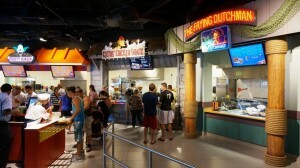 Guests can now place their orders at Fast Food Blvd on their smart phones, using the Universal Orlando app. You can read all about the ins and outs of the process in our write-up. Here are your options for drinking and dining at Fast Food Blvd. You can click on the title of each venue to see photos, read fun facts, and learn more (links will open in a new window for your convenience). We spent 4 days here and I ate a meal form each restaurant! This is an experience that every guest should have, the food and atmosphere are worth the visit alone! We had the pleasure of experiencing this area last summer, just as it had opened and were completely blown away! My girlfriend and I were both stoked to try the foods we had so often watched our favorite characters eat on TV for so long, so expectations were high. Fortunately, we were not disappointed. The Krusty burger was, in my opinion, a refreshingly different taste for theme park food. This could be a result of the secret sauce used, which was fantastic. For dessert, we split a Homer-sized, pink doughnut, which reminded me of a cinnamon roll with frosting. I'm not one to usually buy sweets but this was too good to pass up. Thank God we shared it, because it was very filling and HUGE! The Buzz Cola was just OK but the food and the Simpsons ambiance of the area made up for its mediocrity. Walking into Moe's Tavern was surreal as I really did feel like I was inside the cartoon. I thoroughly enjoyed sitting at the bar and drinking a real life Duff beer. Full disclosure... we expected to enjoy this area going in. However, it exceeded our expectations to the point where we upgraded our next day's ticket to Islands of Adventure to the Park to Park feature just so we could return and experience it once more. I now look forward to returning this summer as the rest of Springfield is complete and will bee-line my way to the Duff Beer Garden and discover what else this area has to offer. A must-go for even the casual Simpsons fan. We visited Fast Food Blvd right after they opened. I could have sworn we were in the middle of the Simpson's tv show! Every detail was perfect. We got up to the counter fast and I had to order a Krusty Burger for the first time. It was what I expected, a big greasy mess...and I loved it! I felt like Homer devouring all the meaty goodness. I washed it down with a Flaming Moe. A cool idea but not worth getting another one. A weak orange soda in a cup of dry ice to make it "smoke". At least I can say that I had one. And for desert I had to get the Lard Lad giant pink iced doughnut with sprinkles. It is actually very good. It's a must to stop in the Fast Food Blvd anytime you're in USF. There is so much to choose from that everyone in your group will be satisfied. I love the whole Fast Food Boulevard since I grew up watching the Simpsons three times a day (life without cable in the 90s). However, I want to write this review for Lard Lad donuts, which doesn't have its own page. 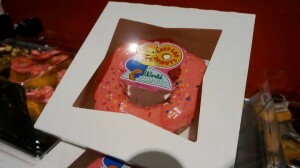 When my partner and I first went to Universal Studios in December, I spotted the giant pink donut in the Fast Food Boulevard. It was quite possibly the largest donut I had ever seen and only $5! I told him we had to get one. "Later," he said. After lunch we went on more rides and explored the park. I kept reminding him that we had to go back for that donut. If you couldn't tell, I have not one sweet tooth but a whole mouth full of them. He kept saying, "Later!" I could tell he wasn't interested and I was sure he would never concede. It got closer to dinner time. Finally, reigniting my last hope, he agreed that it was time! We went to the Lard Lad booth outside this time. Stacks of big pink donuts were whispering my name. We bought our donut and despite how delicious it looked, I suspected it wouldn't live up to expectations and would be dry from sitting out all day. Well, I couldn't have been more wrong! It was an extremely delicious donut, not dry at all, perfectly fluffy. I've always felt that one regular donut was a little too small, so I relished the opportunity to have a little bit more. And if that weren't enough, my partner, who on a good day has about half a sweet tooth, absolutely loved it and thought it was one of the best things we did all day. Now when we go back, that donut is one of the things we get most excited about before we go. I will be there next week and that big pink donut will be mine!! Universal Orlando continues to bring the movies and television series you love to life. The Simpsons area inside of Universal Studios Florida is one of pure amazement and enjoyment. As an avid and devoted fan of The Simpsons, I was excited when the television series was brought to life with the opening of The Simpsons ride. Now I am over the moon and even more stunned by the visual creators who helped bring the rest of Springfield to life with the new Fast Food Blvd area. 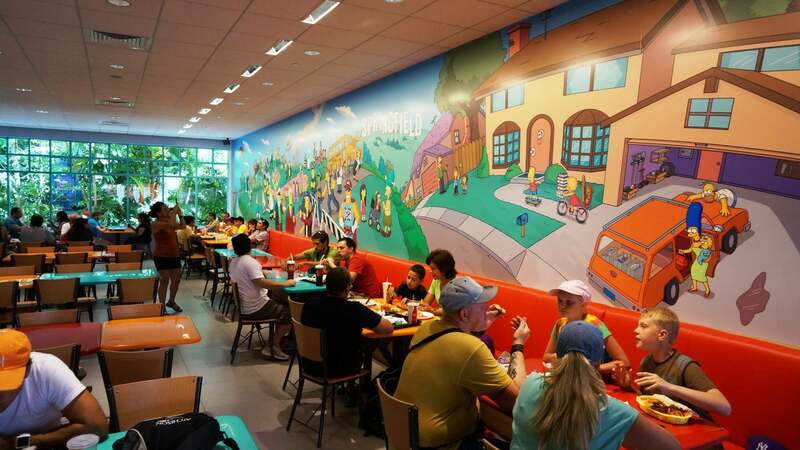 As soon as you walk through the streets of Hollywood, you make the smooth transition from Hollywood into the cartoon and animated atmosphere that is The Simpsons Fast Food Blvd. 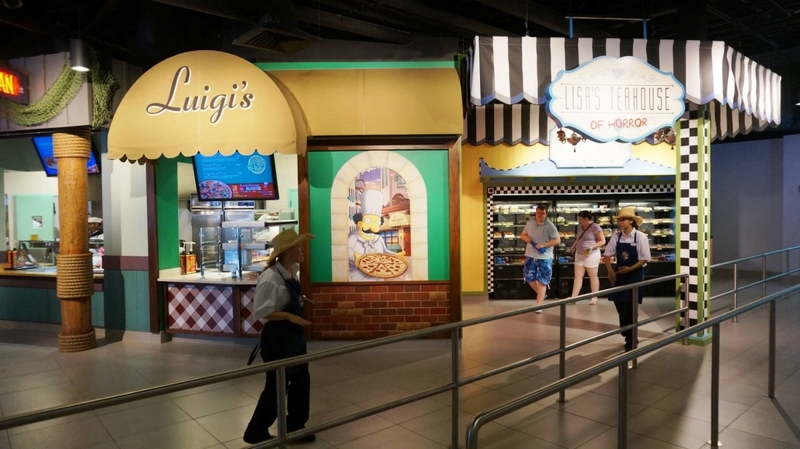 Once you walk into the area, the sounds of The Simpsons theme song, voices of characters and statues help immerse you into the world of the beloved television series. 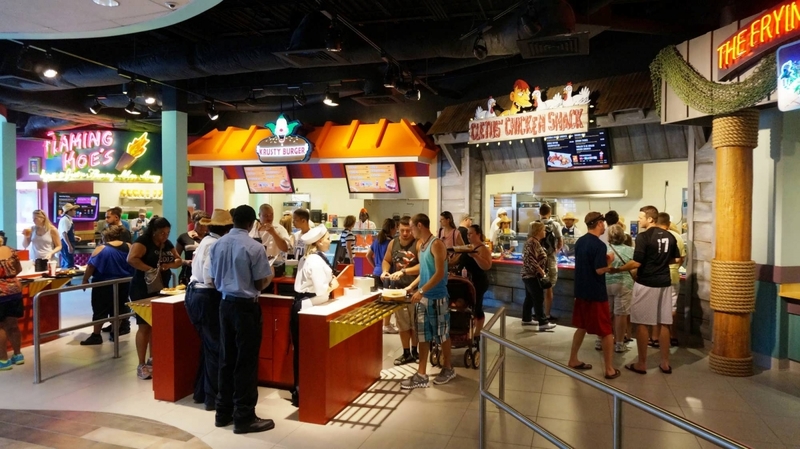 Fast Food Blvd opened in June 2013 and from then, guests can enjoy a variety of foods and drinks that are inspired by the series and iconic foods such as The Krusty Burger or Duff beer that were finally brought to life for fans of the television series or guests to enjoy. Fast Food Blvd has many dining options that are both affordable, delicious and will meet everyone’s dietary needs. 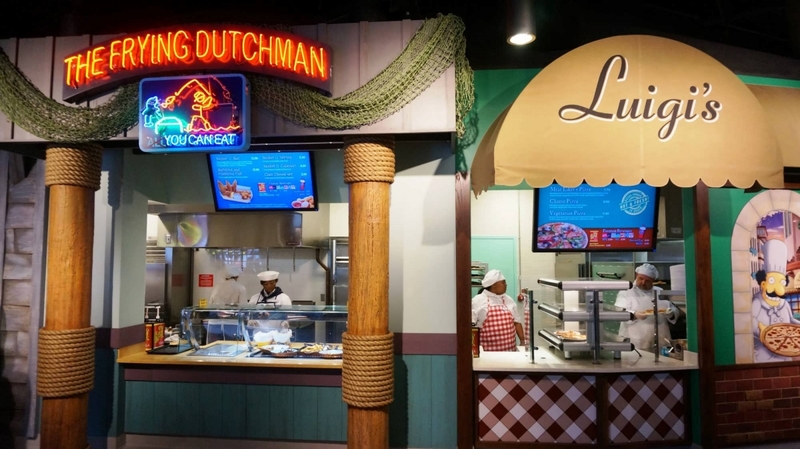 From Lisa’s Teahouse of Horror that provides an assortment of both vegetarian options and light food which is perfect for a hot Orlando day or a quick snack, to The Krusty Burger which serves the famous and iconic Krusty Burger. 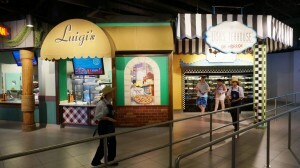 A few other iconic restaurants from the series now have a real life home which include The Frying Dutchman which series seafood menu items and Luigi’s, a delicious pizza slice is what you will find here. The last quick service establishment is Cletus’ Chicken Shack. From the Chicken and Waffle Sandwich to Chicken Thumbs, this will appease anyone who is craving chicken. Now after all that food you might want a drink. Well then venture right on over to Flaming Moe’s where you can purchase the signature Flaming Moe which itself is a beauty. The Flaming Moe is a non-alcoholic specialty drink that taste a bit like orange soda served in a special glass which has a container on the bottle to hold a piece of dry ice in which to give a special effect that everyone will simply say wow before drinking the whole thing down and wanting another. But if that is not what you want, then may I suggest the Groovy Grove Juice which combines orange juice, lemonade, blood orange syrup and served with fresh fruit. It is simply delicious. The signature Flaming Moe is $7.99 plus tax and is served in a collectable glass. All of the other drinks at Flaming Moe are $3.99 plus tax. Now that you have your food and drinks, next up is deciding where to sit. One area I would suggest to sit at if you can manage to find a spot is inside Moe’s Tavern. The décor for this place is simply astounding and it feels like you just walked right into the show and opened the door to Moe’s Tavern. But if a tavern is not your feel, then there is The Krusty Burger dining area that offers the fast food dining area feel but with the Krusty Burger atmosphere. 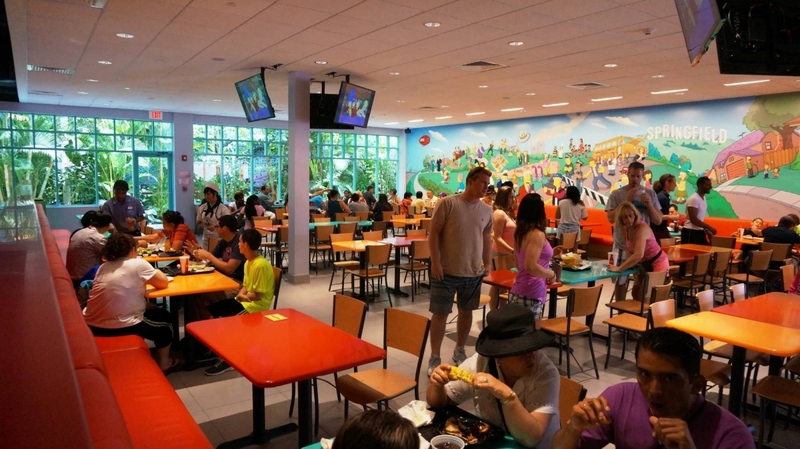 The last dining sitting area is the open area one can see when you enter the inside of Fast Food Blvd, which has Simpsons artwork on the walls and various clips running on the television screens above. Overall, I would give this area five out of five stars because of the variety of dining options offered, affordable options from $3.39 to $12.99, atmosphere, décor and just the overall experience. If you are a fan of the television series or if you are not, you will still enjoy the food and drinks this area has to offer.